With age comes a better understanding of oneself, as well as the knowledge of those things we truly value. Experiences with family and close friends far outweigh the party scene. This year I wanted to go someplace new to celebrate the New Year with my daughter Kya, so I started brainstorming places nearby that I hadn’t been to and that would be enjoyable for both of us. 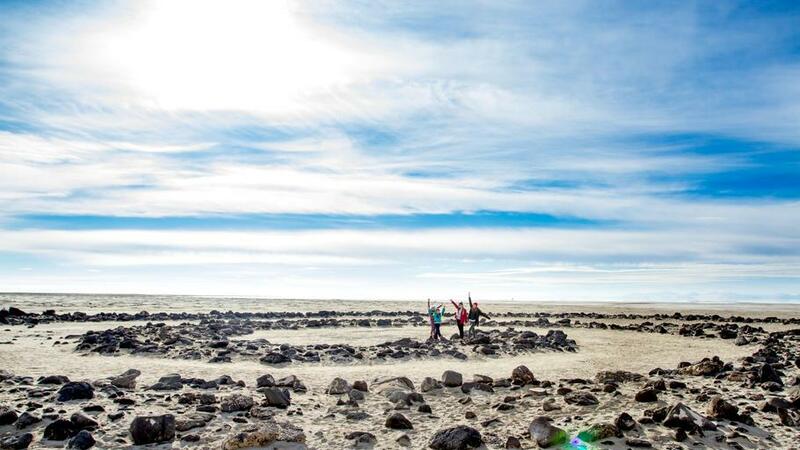 One place that had been on my Utah bucket list for a long time was the Spiral Jetty, located on the northeastern shore of the Great Salt Lake. We could combine this road trip with swimming and water slides in the hot waters of Crystal Hot Springs, which would be a win/win for both of us. Kya really wanted to bring a travel companion with us, which is a common request being an only child, so we called her cousins (ages 8, 13, & 17) and they were excited to join us on this adventure. 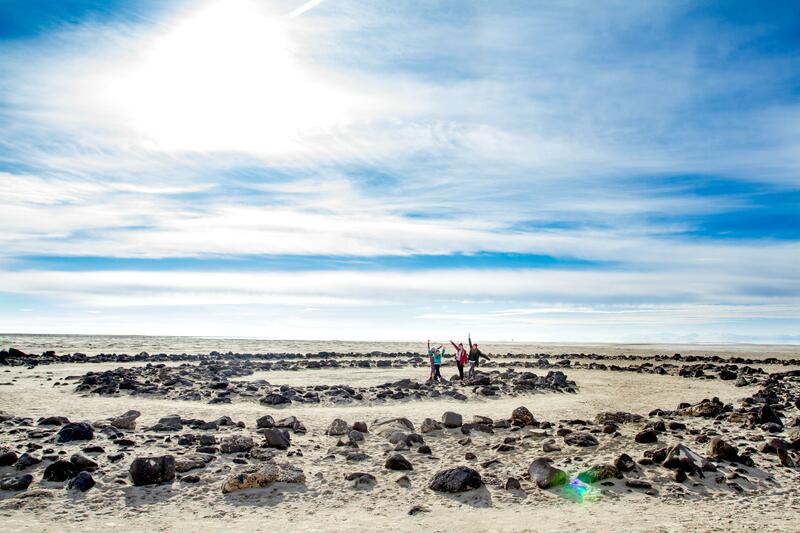 The Spiral Jetty, created in 1970 by American sculptor Robert Smithson, is an earthwork sculpture made of 6,000 tons of basalt rock. 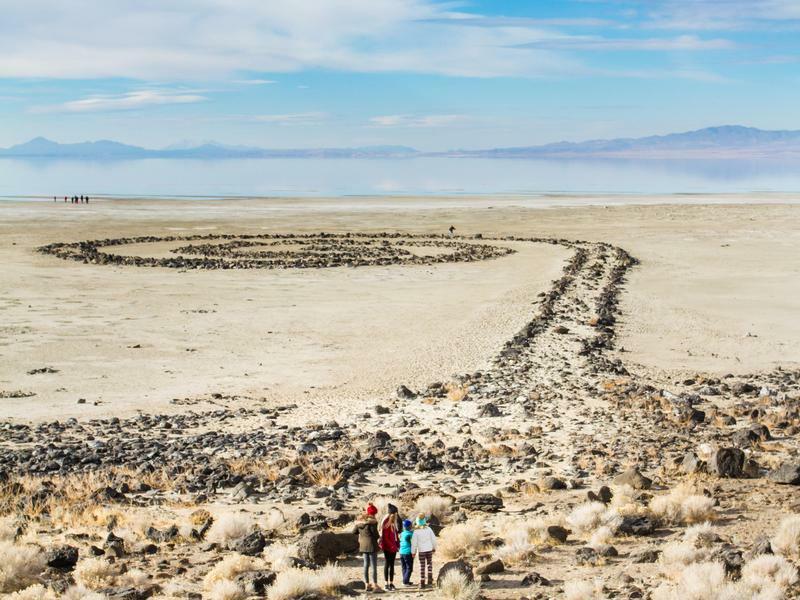 This uniquely-awesome art piece is a massive 1,500 ft long and 15 ft wide forming a counterclockwise coil jetting off the shore. 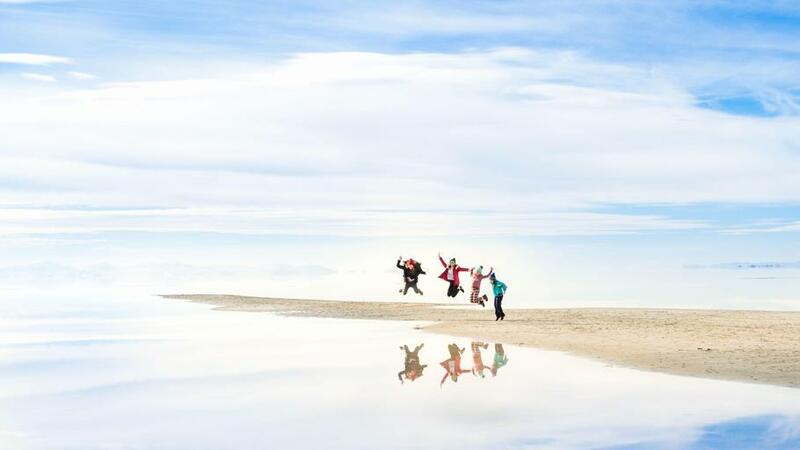 Not long after it was created, the masterpiece was fully submerged by the rising waters of the Great Salt Lake, only to show its beauty a few times when water levels dipped over the next 3 decades, then fully reemerged again in 1999. Since then the Jetty has attracted hundreds of thousands of visitors from around the world, and in March of 2017, Governor Gary Herbert signed a bill designating it as Utah’s Official State Work of Art. 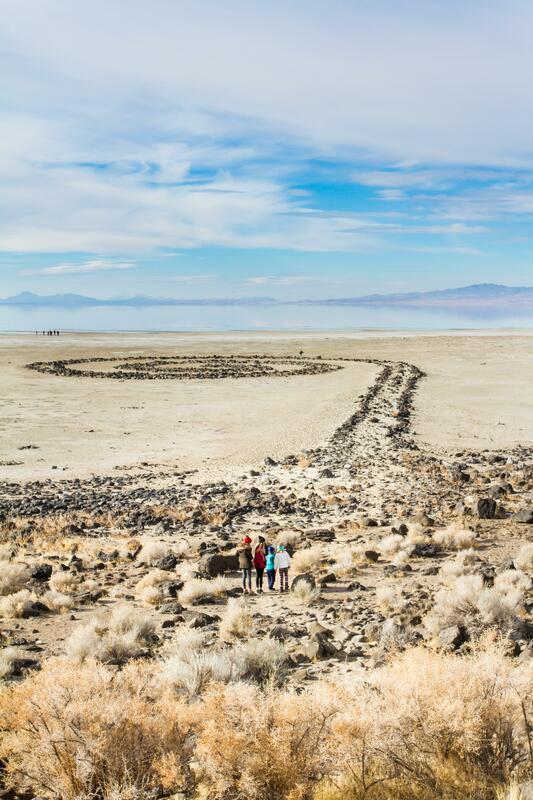 In 1999 the Spiral Jetty was donated to Dia Art Foundation. The Utah Museum of Fine Arts works in collaboration with Dia Art Foundation and Great Salt Lake Institute at Westminster College to preserve, maintain, and advocate for this masterpiece of late twentieth-century art and acclaimed Utah landmark. 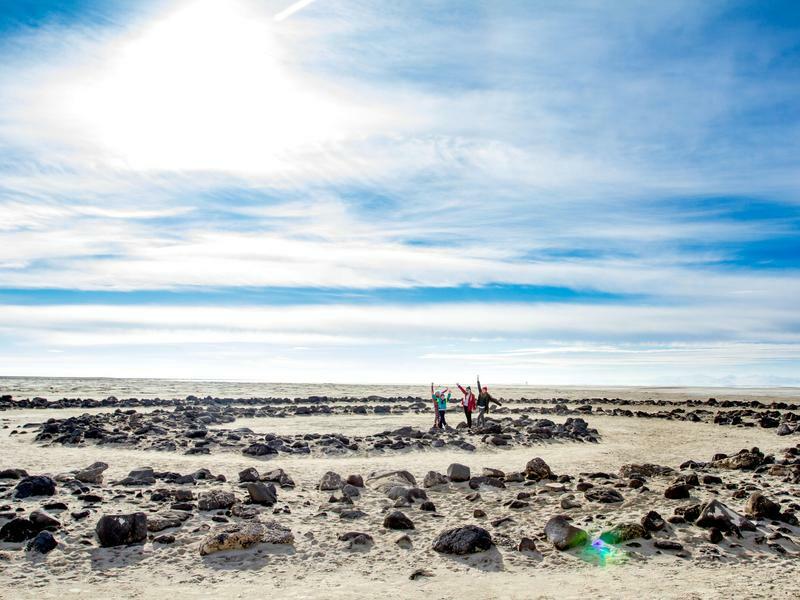 Dia leases the lake bed where Spiral Jetty is located from the State of Utah Division of Forestry, Fire and State Lands. The morning started off a bit chilly and overcast, but I was very excited to be exploring this awesome new place. We pulled into the small parking lot just before 8 am and there were already a couple of cars; I guess we weren’t the only ones looking for an amazing place to start off the new year! 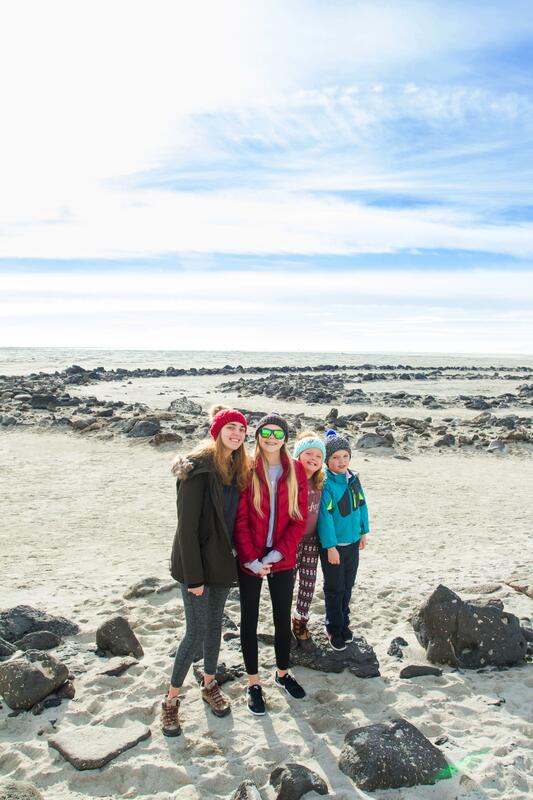 We spent a couple of hours exploring the Jetty and the natural wonders of the Great Salt Lake. As a photographer, the reflections the lake provides are always illuminating to me. The overcast morning soon shifted, allowing the sun and blue sky to appear creating a surreal backdrop. 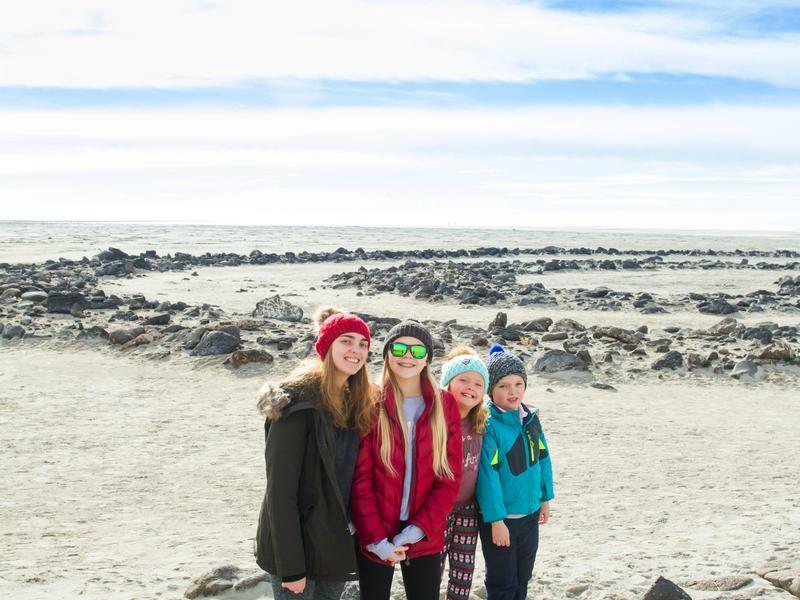 The cold hindered the usual water and sand play for the kids, which curtailed our exploration time, but the joy of the day was spending time together and making sure we all had a memorable first day. We headed on to the next stop: Crystal Hot Springs, which for kids who absolutely love to swim was by far the focal point of their day. The drive was about an hour away which gave the kids time to take a little snooze before hitting the pool. The water temperature at Crystal Hot Springs ranges between 120 – 134°F and contains the highest mineral content (46,000mg/L) found in any hot springs in the world, which was the perfect reprieve after the morning’s chilly adventure. I enjoyed just soaking and relaxing in the mineral-dense waters while the kids made laps on the two hydro-tube water slides. There are 3 mineral hot tubs, a large soaker pool, an Olympic-size pool and a kid’s pool with a waterfall that the kids can explore behind. 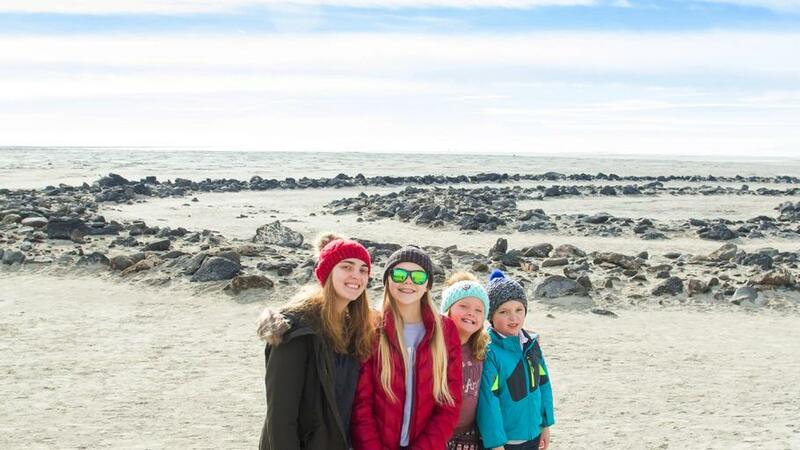 On the drive home I asked the crew what their favorite part of the day was, and it was no surprise that they all absolutely LOVED swimming, but what was surprising and heart-warming was that they also LOVED exploring the Spiral Jetty as well, and unanimously requested that we all go back together another time when it’s just a bit warmer. It is not always easy finding symmetry with your kids, and, at times, it feels so much easier to just stay home than to pack up everything needed for an adventure in hopes that everyone will equally enjoy the experience. But with some good planning to combine a unique, beautiful place with consideration for activities the whole family will enjoy, you can’t go wrong.